You know those people in your life who you were close with for a period of time and then you move away, change jobs, or just take a different path? You mean to stay in touch, but somehow the years fly by and you never do. One of the unintended consequences of my blog is that it has reconnected me with several people from my past. A mutual friend tells the long-lost friend about Been There, Eaten That and it motivates them to contact me. Every now and again when I grow tired or frustrated with blogging, I think about these renewed acquaintances and it re-energizes me. I have chosen The Bombay Club as the spot to reconnect with a friend I haven’t seen in more than 25 years. I’ve never been to Bombay Club, but it is a relative to Rasika, one of my favorite DC restaurants. Both are owned by one of DC’s premier restauranteur’s Ashok Bajaj. Bombay Club, currently celebrating its 25th birthday, is older than Rasika and not quite as sought-after as a destination. But it has a solid reputation, and has been on my to-do list for quite some time. It’s challenging to focus on a menu when you have 25 years of catching up to do. Fortunately I have done a little pre-scouting. A must-have on my list is is the Bombay Club version of one of Rasika’s most famous dishes, palaak chaat. I consider this one of my favorite dishes of all time. The Bombay Club version replaces spinach with kale. 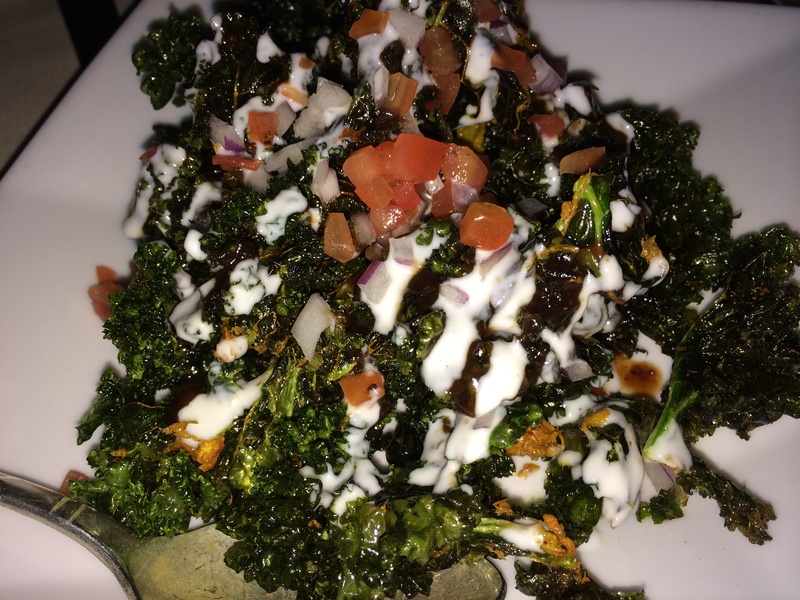 This rendition is a heavenly blend of crispy kale, date-tamarind chutney, bits of tomato and onion, and a smattering of yogurt. It is both familiar and new. Crispy butternut squash samosas are enjoyed as we alternate between conversations on current jobs and kids, and reminisce about the workplace where we met early in our careers. I have to stop chatting for a moment to focus on the food. When methi shrimp with ginger, garlic, and fenugreek seeds is set before us, there is a shared moment of awe expressed at the dish before us. 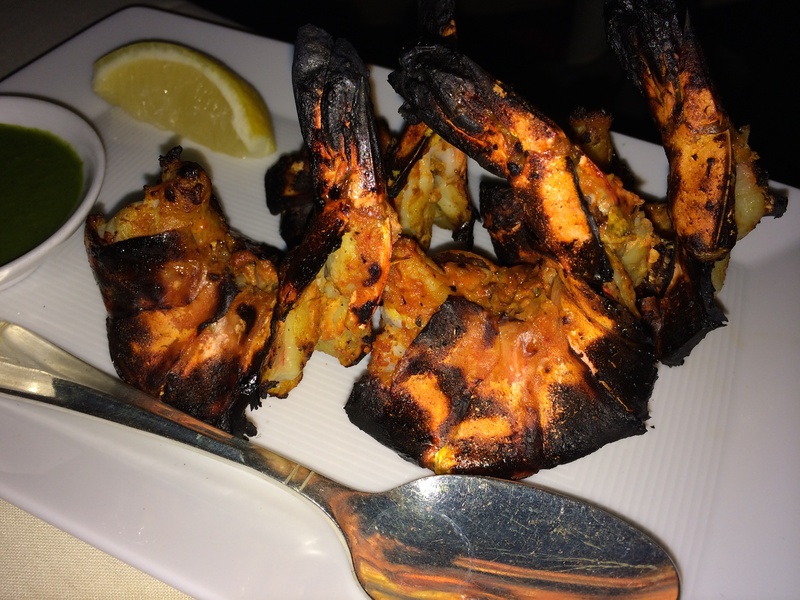 The plump charred shrimp momentarily capture our full attention. They are cooked to perfection, and the slightly sweet and nutty flavor of the fenugreek is just enough to add interest but not overpower. Goat cheese kulcha sounds better than it is. We agree that the bread is soggy and bland. We mention this to our server who silently whisks it away and brings a plain naan per our request. (We are charged for both breads, and think it would have been nicer had the replacement naan been gratis. But this is a minor quibble). 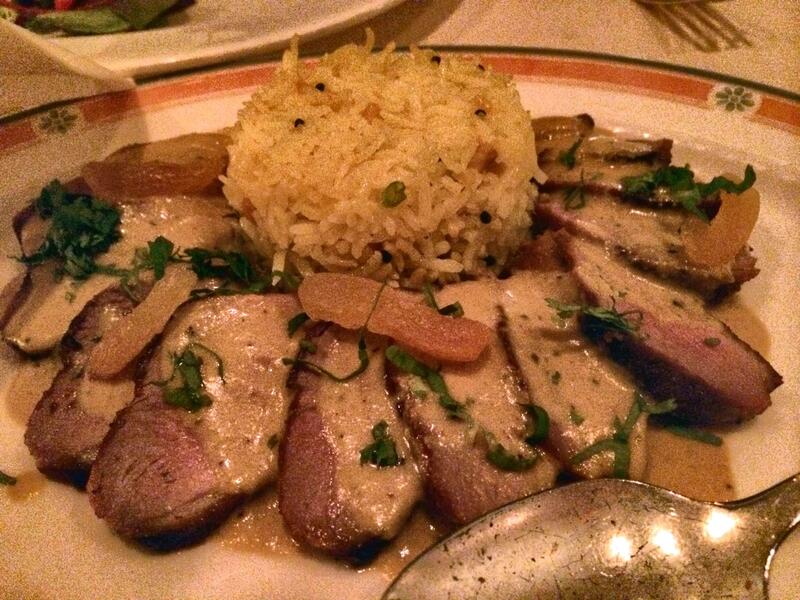 Khubani duck with apricot, onion, cashewnut, and mace flavor is beautiful and complex. The mace is a little too strong for my liking, but the apricot provides a nice balance. The tender duck is melt-in-your-mouth goodness. The dining room at Bombay Club is more formal than Rasika, the food a bit more subtle in flavor. I like the sophistication, which seems appropriate for a get-together that reflects on the passing of time. As the meal progresses, it is clear that my friend’s recollections from the years we spent working together are much more vivid than mine. Some of them startle me in their preciseness. But from the moment I see her, there is a familiarity in her voice and gestures that evoke memories from the past. It is unfathomable to me that there has been a 25 year gap since last we met. It is equally incomprehensible that my culinary path has not yet led me to Bombay Club. I don’t intend to let another 25 years pass before I get to Bombay Club, or to meet up with my friend again. Although the good news is that I won’t have to jog my memory about this experience. Another unintended consequence of Been There, Eaten That.